Last week I took a train to NYC. It was a busy two days at the office. Things are moving steadily on the blogging network front. I’ll have more news probably pretty soon. On Tuesday afternoon, I joined the last class of the semester of SHERP (New York University’s Science, Health and Environmental Reporting Program) and then the graduation party for the 28th generation. 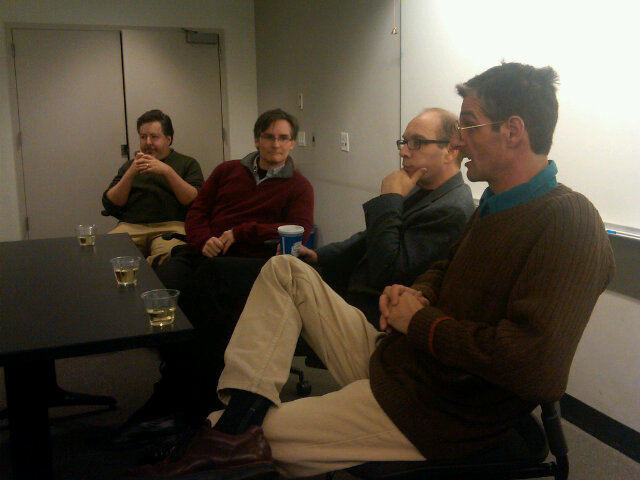 Both the 28th and the 29th class were there, packing the room, in which five of us discussed the current state of science journalism. So bummed we keep missing one another on your Northeast sci scribe exploits. Can’t wait to follow the fusing of your collective brainwaves in 2011.
hmmm… possibly 4 people who barely sleep; maybe good subjects for a circadian rhythm research study…. ?